Fancy names, which do not make a stable or honest company, are often just created to impress the simple-minded. Listed below are some of the impressive-sounding stocks that were traded in the NASDAQ, OTC and AMEX markets and used to defraud investors out of approximately $106 million over a three year period by a boiler room brokerage which used fraudulent, deceptive and high-pressure sales tactics to induce investors to purchase the speculative broker-recommended stocks. Diamond Entertainment Corp.; First Chesapeake Financial Corp.; Futurebiotics Inc; Immunotherapeutics Inc.; International Franchise Systems Inc.; Las Vegas Entertainment Network Inc.; Officeland Inc.; Red Hot Concepts Inc.; Sanyo Industries Inc.; U.S. Transportation Systems Inc. and International Thoroughbred Breeders Inc. Though it sounds stable and productive, the title of "Corporation" can be acquired for a few hundred dollars and may represent a single person with a phone and pen whose only assets are his sucker lists. They are often set up just to allow for a planned corporate bankruptcy which will not affect the individual scammer's credit rating. Proceed with caution when you are encouraged to invest in a "general partnership" or "limited liability company." Many of the current crop of high-tech, real estate and exotic livestock deals are packaged as "general partnership" or "limited liability companies" in an attempt to evade the consumer protection requirements of state and federal securities laws. These laws are designed to require promoters to disclose all pertinent facts about themselves and the investment. In attempting to skirt these laws, the promoters may conceal personal bankruptcies, previous securities law violations, risks (including lack of expertise and competing technologies) and actual marketing costs (some of the high-tech deals involve 40-60% commissions for sales people, leaving little or nothing for the actual project). I love your site. I haven't had a chance yet to thoroughly digest it, but your writing is great. I'm a CPA who, for the last eleven years, has worked with several hundred people of the possibly 3,000 victims who were defrauded by Walter J. Hoyt, III, using cattle partnerships as investments. The brilliance of his scheme, however, was that the investors used their tax money to fund his operations. Mr. Hoyt was an affable man, dressed in cowboy attire, who was general partner of all the partnerships as well as the tax matters partner. He was also an Enrolled Agent and had a tax preparation service. He controlled the preparation of the partnership returns and the individuals' returns, allocating investors sufficient losses to reduce or entirely eliminate their income tax liability. Then they had to pay him 75% of the refunds. His operations were audited continually by the IRS, who knew very well that he did not have the cattle he claimed to have and neither did the cattle have the value he claimed they had. Nonetheless, for over twenty years, they made no effort to strip him of his Enrolled Agent's status. During all this time, Mr. Hoyt kept on extending the statute for assessment of partnership taxes. After TEFRA passed in 1982, this meant that effectively he extended each investor's return indefinitely. The investors did not know this. Like most people, they assumed that after three years passed, the IRS couldn't come back at them any more. They couldn't have been more mistaken. Some continued to receive refunds for over twenty years before they found out the truth. Mr. Hoyt targeted middle class taxpayers. Most of them very good, church-going people. He sold what he called "retirement plans for the middle class." Few investors made more than forty to fifty thousand a year in their peak earning years. A lot of utility company employees were involved because Hoyt got a strong foothold in our local municipal power company, SMUD, through "satisfied" investors selling to other people ("Hey, I get a refund every year. I never pay income tax. I've been doing this for five, ten fifteen years"). Most of them worked at our now-defunct Rancho Seco nuclear power plant and subsequently moved elsewhere, where they would recruit other investors. I don't think there is a single state without a Hoyt investor in it. Even the Merchant Marine was infected with the Hoyt virus. In the early nineties, the scheme began to fall apart. Investors began to receive tax bills that required they repay not only the initial tax refund but also penalties and interest. Since years from the late seventies and early eighties were involved, it was not uncommon for the interest to total four to five times what the initial tax bill was. Multiple years were involved and, in addition, Hoyt had filed for net operating loss carry-backs in the investors' first year of partnership involvement - which went back and refunded tax for the three years prior. I had clients with bills in the hundreds of thousands of dollars. Roughly twelve hundred of the investors were die-hards and even though the IRS made several settlement offers (each of which had terms that rendered bankruptcy the only viable option for most investors), these people went on fighting. They still have over 700 docketed cases and when those decisions are rendered, these people will not only have disallowed losses, they will have income attributed to them. I know this because some of the cases have been decided and the court will follow the precedent established. The IRS was careless in the audit adjustments they did, most of which were upheld by the court. If cash came in, they treated it as income, even if it was a contribution from a partner. So these people will be paying taxes on money they contributed, plus interest at a tax-motivated rate. Many of the bills will exceed a million dollars. Earlier this year, Mr. Hoyt was convicted of fifty-something counts of mail fraud and assorted other charges in Oregon. Tax fraud was not amongst them. The IRS stayed out of the case which was investigated by the United States Postmaster and the Federal Bureau of Investigation. The "Oregonian" newspaper has, I believe, archived some articles covering the trial under the heading "Bull Market" that you might like to glance over. One of the die-hard investors sponsors a web-site with some interesting, if occasionally suspect, information on the scam. Their address is www.mindconnection.com/hoyt/. This site has links to articles in newspapers. I thank you for your site and will come back when I have more time. I'm still doing tax returns. Note: For more info on Tax-Related Investments hit the link. Roger Carter invested for almost 20 years in an Eastern Oregon ranching empire with the expectation he'd have a tidy nest egg to help pay for retirement or the kids' college expenses. But today, that money is gone, and that's just the start of it. His ill-fated involvement with Burns-based Hoyt & Sons leaves him facing a debt that could exceed $250,000 —courtesy of the Internal Revenue Service. That number is so scary to his family, said Carter, 53, that he survives day-to-day by not thinking about it. "It's devastating," he says. "But for our emotional health, we can't dwell on it." Carter, an electrician from the community of Corbett at the western end of the Columbia Gorge, is one of an estimated 3,500 people in 41 states who bought into a multilayered tax shelter scheme run by smooth-talking cattleman Walter J. Hoyt III. Hoyt was convicted in 2001 of fraud and money laundering in a case called the biggest agricultural scam in U.S. history. According to court documents, the 20-year scam bilked more than $100 million from investors who didn't realize they were sinking money into overvalued ranchland and livestock that existed only on paper. Hoyt, now 63, is at a low-security federal prison southeast of Phoenix, Ariz. He is scheduled for release in 2018. For investors, the headaches didn't end when Hoyt went to prison —and there's no end in sight. They now must deal with the Internal Revenue Service, which continues to assert that investors weren't actually victims of a scam but willing accomplices and tax cheats, even in spite of the guilty verdict. "There's no change in the IRS position," said Wendy Pearson, a Seattle attorney who is representing a coalition of investors. The stakes are huge: The IRS is seeking massive penalties and interest worth tens of millions from victims. Those penalties in many cases dwarf their actual investment in the Hoyt & Sons venture. About one third of the investors have yet to settle with the IRS. Most owe between $50,000 and $500,000, Pearson said. The ongoing pursuit of Hoyt's victims flies in the face of an admonishment from the federal judge who presided over Hoyt's criminal trial. After handing down a 19-year prison term in June 2001, U.S. District Judge Robert E. Jones asked the IRS to ease its aggressive stance toward investors. "Victims in this case truly were victimized by a person capable of the greatest deceitful practices," he said. "My strongest recommendation is that those remaining cases be resolved." Yet the IRS continues to argue for maximum penalties in tax court. The IRS remains mum on the subject of Hoyt, his investors and the efforts to collect stiff penalties from them. "There is no comment at this point," said Shawn N. George, a spokeswoman in the agency's Seattle office. Montgomery Cobb, a Portland attorney who now handles the legal affairs of the complex web of Hoyt-formed partnerships, said there is no signal the IRS is ready to negotiate anything with investors whose cases are still open. Right now, the only option is for investors to agree they committed fraud and pay all the penalties, he said. "Everything is still in limbo," he said. Yet it makes little sense to keep dragging it on, Cobb said. "The amounts accumulating right now are almost irrelevant because they are so far beyond each taxpayers' ability to pay." Seattle attorney Pearson said investors all agree they should pay back any tax benefits that weren't warranted, but believe it's unfair for the IRS to demand penalties and interest at rates as high as 120 percent a year. In addition, investors say the IRS shares part of the blame for the Hoyt fiasco. The agency helped Hoyt perpetuate his scam because the agency allowed Hoyt to act as the primary tax matters liaison for his complex network of partnerships, she said. And that's even though he was under investigation for fraud since the early 1980s. "For six years they gathered enough information to determine that he was selling nonexistent cattle and misrepresenting the financial position to partners and commingling funds," she said. The IRS has the authority to remove a tax liaison for a partnership if foul play is suspected —but Hoyt wasn't removed as the tax matters partner for his 100-plus partnerships until this year. Also this year, it became clear the IRS has withheld documents that could have helped investors in a string of tax court defeats, said Gary Blackburn of Orovada, Nev., an investor who once worked for Hoyt & Sons. He owes an estimated $750,000, of which more than $500,000 is penalties and interest. "Every time we go to court, they win. Every time we appeal, we lose," he said. "All these documents we got after the trial and we needed them before the trial." Based on the paperwork, the IRS should have taken action against Hoyt in the early days of the fraud —or at least told investors it was a scam, Blackburn said. "They could have shut him down in the 1970s when he had just a few hundred investors," he said. "But they didn't tell anybody or stop anybody." Not all investors know yet what their total bill could be, he said. The IRS is still auditing partnership records and more than 800 cases are still pending in tax court. "The people are still waiting for the hammer to drop," he said. The Hoyt saga has its roots in the 1960s near Sacramento, Calif., where Hoyt and his brothers began raising prized shorthorn cattle and forming partnerships to buy and own them. The business settled in the sage-swept high desert of southeast Oregon in the 1970s. By 1980, according to audits, Hoyt was selling investors cattle that didn't exist. A licensed IRS tax agent, he'd complete his investors' returns and assign each of them a share of the cattle-raising expenses, which they would then use as a deduction to reduce their taxes. Investors didn't realize they were deducting costs associated with cattle that didn't exist. When their refund checks arrived in the mail, investors would send 75 percent to Hoyt to pay for their cows. Hoyt targeted unsophisticated investors he dubbed "Johnny Six-Pack," but some of them were military officers and professionals. At its peak in 1987, the business sprawled across more than 500,000 acres of ranches and leased BLM land from Harney County to the Idaho border. It employed more than 200 people, most of whom became ensnared in the tax problems because Hoyt also made them partners in the company. In those days, investors would trek to Burns for annual folksy barbecues and ranch tours, blind to the fact the herds of so-called "super cows" were vastly overstated in size and value. Roger Carter was one of those visitors. He'd first started investing with Hoyt in 1984 after getting the green light from his attorney and tax preparer. By the early 1990s, he was having doubts about the company —but was convinced everything was kosher after ranch tours in 1991 and 1992. There seemed to be plenty of cattle. "Whenever we were on the ranch in Burns, the facilities confirmed all our hopes and wishes and we went away comfortable." But in 1993, an IRS cattle count showed that Hoyt owned a total of 7,903 cattle. At that time, Hoyt claimed he owned 26,205. But investors weren't told —and Hoyt wasn't shut down for good for another five years. He was arrested in 1998 after an investigation by the FBI and postal inspectors. Carter, who kept sending Hoyt money until the very end, said he feels betrayed —but even more so by the government, which he thought was supposed to protect the little guy. "I was brought up to believe for the most part that government is good and they are there to help," he said. "After our dealings with Hoyt, we found the government isn't really willing to help and instead will take advantage of people if it is to the government's benefit. It's a very bitter feeling." Carter also places some of the blame on himself, he said. "I allowed myself and my lack of education to put my family's future in jeopardy," he said. He said he's not a tax protester and agrees that he should pay back any improper deductions, but he is holding out hope that the high penalties and interest can be erased or reduced. "If I didn't think there was a positive outcome down the road, this would be senseless," he said. "We're just hoping it will be more favorable than the worst-case scenario." BEND, Ore. —AP Seattle Times - 12/08/03 - Thousands of investors in an ill-fated tax-shelter scheme run by a smooth-talking cattle baron from Eastern Oregon still face investigation by the Internal Revenue Service, despite a federal judge's urging that the IRS ease its stance. About one-third of the investors have yet to settle with the IRS. Most owe between $50,000 and $500,000, said Wendy Pearson, a Seattle attorney who is representing a coalition of the investors. Known as the "Paper Cowboy," Walter J. Hoyt III of Burns was sentenced in 2001 for selling cattle that existed only on paper, as well as other schemes. Investors used shares in the nonexistent herds for tax shelters. Hoyt conned investors in 41 states out of more than $100 million in a case that has been called the biggest agricultural scam in U.S. history. Now 63, he is in federal prison. But investors still must deal with the IRS, which believes that they were not victims of a scam but willing accomplices and tax cheats. The IRS disallowed the tax deductions and billed investors for repayment. The ongoing pursuit of Hoyt's victims goes against an admonishment from the federal judge who presided over Hoyt's criminal trial. After handing down a 19-year prison term in June 2001, U.S. District Judge Robert Jones asked the IRS to ease its aggressive stance toward investors. Pearson said investors all agree they should pay back any tax benefits that weren't warranted, but they believe it's unfair for the IRS to demand penalties and interest at rates as high as 120 percent a year. Investors say the IRS shares part of the blame for the Hoyt fiasco because it allowed him to act as the primary tax-matters liaison for his complex network of partnerships, Pearson said. A licensed IRS tax agent, Hoyt would complete his investors' returns and assign each of them a share of the cattle-raising expenses, which they would then use as a deduction to reduce their taxes. Toll-free telephone numbers which phone companies can put in homes; postal service centers, call forwarding, executive service centers and voice mailbox services are all used by fraud professionals to hide their location and identity. You have no idea when you are calling a phone number today where that call is actually going. Call forwarding can give multi-office, even international respectability to one tiny home office. They can have a tape recording of plant sounds or hectic office noises in the background to create an illusion in your mind. One operation worked from a little office with multiple phone lines coming into it. They acted as their own references and their "bank" to people who were encouraged to check up on them. A call to a reference number in Japan was routed right back to the scammers for a glowing report. Another crook even continued to operate his credit fraud scams from a prison payphone. Some foreign fraudulent telemarketers hide the fact that they are not based in your country. Some use 800 numbers that connect United States consumers to boiler-rooms located in Canada and visa-versa. Consumers are not likely to expect that calling an 800 number would connect them to a foreign country. Even consumers who understand that they are talking with someone in a foreign country may not understand the implications this may have on their rights, or on the ability of their respective government to investigate and redress fraudulent practices. Officials are seeing a new trend in investment scams whereby supposedly foreign companies pretend to operate outside the US but are actually operating, and scamming US citizens, domestically. All it takes to create this illusion is a contract with a business services company (i.e., a mail forwarding/phone answering service) in the country of your choice, and a website identifying that foreign address and telephone number as the company's business contacts. In a case involving Donald O'Neill, he purported to be placing customer funds with a German securities firm, when in fact the "firm" was nothing more than a German business accommodation address for which O'Neill paid, and that forwarded all calls and correspondence right back to him. If your only contact is by mail, the office may bear a prestigious sounding address on a prominent street in a major financial district. Often, this is nothing more than a mail drop or forwarding service from a mail box rental service. Keep in mind that a "hot" industry does not necessarily translate into a "hot" company. Just because a lot of headlines are being generated about the prospects for a new or emerging high-tech industry does not mean that a specific company is going to be part of the overall success story. Promoters of illicit schemes often attempt to make themselves seem more legitimate by providing copies of glowing news articles from the Wall Street Journal, Business Week, Forbes and other business publications. Take the time to look at these stories carefully. If they do not mention the company that has approached you, they are irrelevant to your investment decision. 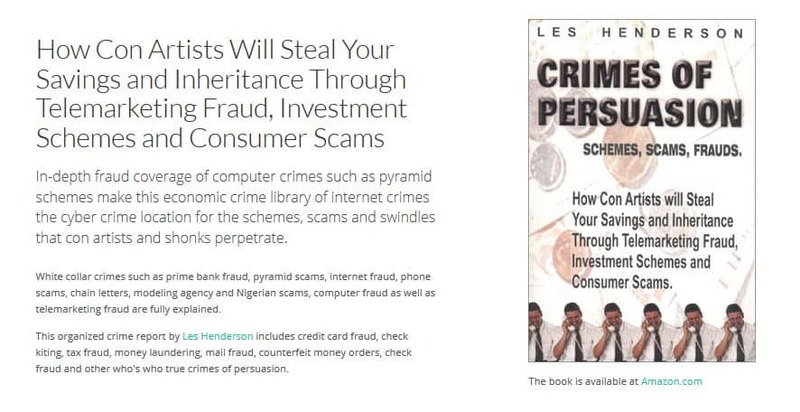 Some fraudulent investment promoters will fool you with web sites that make their "investment company" look like a solid, top-rated Wall Street investment firm with a slick-looking web site that uses graphics, audio and even video clips. While even the fastest-talking boiler-room operator would be hard-pressed to make more than a few hundred "cold call" telemarketing pitches in one day, they can now send e-mail to many thousands of individuals in less than an hour and can post a bulletin board message that may be read in a matter of weeks by individuals around the world. While many bulletin boards dedicated to investment topics are interested in little more than swapping ideas about specific stocks and exchanging general financial advice, there is a shady group of individuals using them to enrich themselves at your expense. A temporary worker for Goldman Sachs and Credit Suisse First Boston who had access to non public information about impending mergers and acquisitions passed the info on in a chat room where it was used to net an estimated $8.4 million in illegal insider trading profits. As one online promoter has marveled: "With the online world growing quickly, we can reach hundreds of thousands of people with a single message. I can make it appear that many people are posting on many different systems, all talking up a stock." Some deceptive investment information sites may ask you to submit personal financial information online to determine whether you're an "accredited investor." In addition to your name and e-mail address, you may be asked for your income level, bank account information, Social Security Number and other personal information which is used to help them develop a qualified "lead list". 06/23/03 NEW YORK (Reuters) - A London lawyer has pleaded guilty to attempted racketeering in connection with an international stock fraud conspiracy that operated in New York and Britain, prosecutors said Thursday. Andrew Warren, 56, of Norfolk, in eastern England, a former partner in the London firm of Talbott, Creggy & Co., made a plea agreement in connection with his role as legal counsel to a criminal enterprise run by Westfield Financial Corporation, a registered broker dealer in New York. State Supreme Court Judge William Wetzel will sentence Warren on Aug. 4 to a state prison term expected to be between 20 months and five years. He had faced up to 25 years in prison if convicted after a trial. Warren was first indicted in June 1999 in connection with the stock fraud, in which thousands of British and U.S. investors were allegedly cheated of more than $17 million. The scheme allegedly involved the sale of unregistered securities to foreign shell corporations secretly controlled by Westfield. The principals are alleged to have run up the price of stock to profit at the expense of innocent investors. Warren was charged with setting up and helping to manage the shell corporations. Manhattan District Attorney Robert Morgenthau said that as part of the scheme lawyers in London and Canada recruited a "distinguished" Liberian diplomat to pretend to own the companies, paying him substantial sums while obtaining blank signed documents from him to use in the fraud. On July 10, 2002, a default judgment was entered against Mark Schultz, 49, an internet stock touter who now lives in Spain. Schultz received undisclosed stock and cash compensation from at least twelve issuers between 1995 and 1998 for touting their stock. Those issuers are Acacia Research Corp., American Entertainment Group, American Nortel Communications, AWG, Ltd., Eutro Group Holdings, Inc., EVRO Corp., Imagica Entertainment, Inc., Imaging Diagnostic Systems, Inc., N.U. Pizza Holding Corp., Tessa Complete Health Care, Inc., Wasatch International Corp., and WestAmerica Corp. The Commission's complaint alleged that Schultz's recommendations typically made inflated financial projections and predicted short-term price increases of 100 percent or more. The Commission's complaint also alleged that Schultz misrepresented his recommendations of these issuers as the product of independent analysis when in fact his publications were merely paid tout sheets and was paid "bonuses" if the stock he touted achieved certain price levels. The complaint also alleged that Schultz engaged in the practice of "scalping" or selling stock contrary to his circulated recommendations. Schultz moved from Florida to Spain in approximately late 1998. He did not file an answer to the SEC's complaint or contest the allegations, prompting the Court to enter a default judgment. In its order, the Court permanently enjoined Schultz from future violations of Sections 17(b) of the Securities Act of 1933, and Section 10(b) of the Securities Exchange Act of 1934 and Rule 10b-thereunder, and ordered him to pay disgorgement of $566,035.93, to pay prejudgment interest of $300,871.22, and to pay civil penalties of $110,000.00.